Yay welcome to my first product review for 2017! 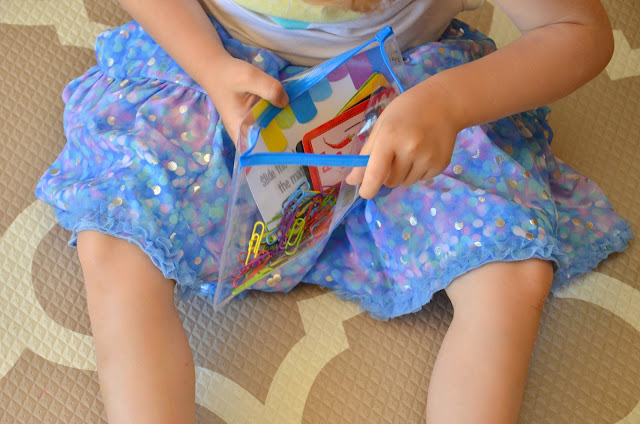 Busy bags can be a life saver when you're out and about or travelling - and I love to make my own (sometimes rather haphazardly thrown together). 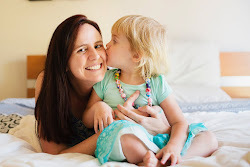 But if you'd like someone else to do that for you (who also has a teaching background I might add) then look no further than Bianca from Flying Sprout. 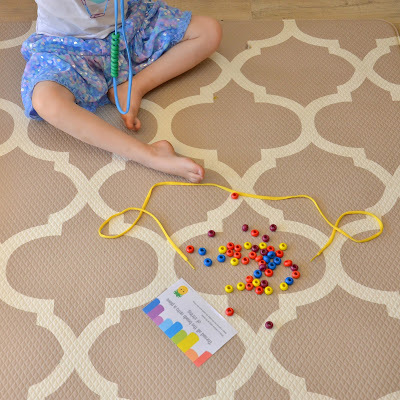 So Miss M got busy testing them out - and I got to thinking about how they could be easily adapted to suit children of various ages and abilities with a few simple alterations. Task - sort the coloured paper clips into colour groups and attach them (or just place them) on to the coloured cards. 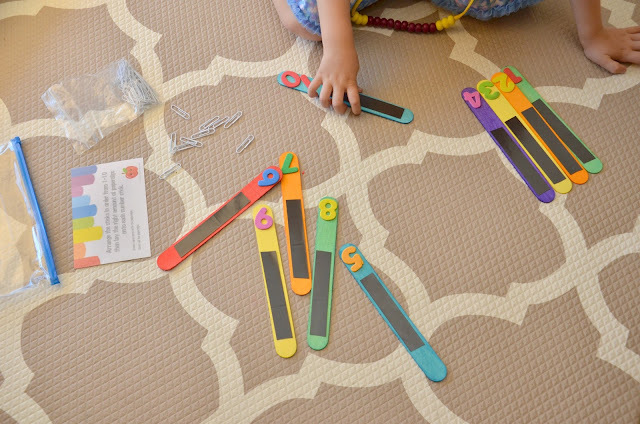 Skills - sorting, colour identification, counting, fine motor, language. 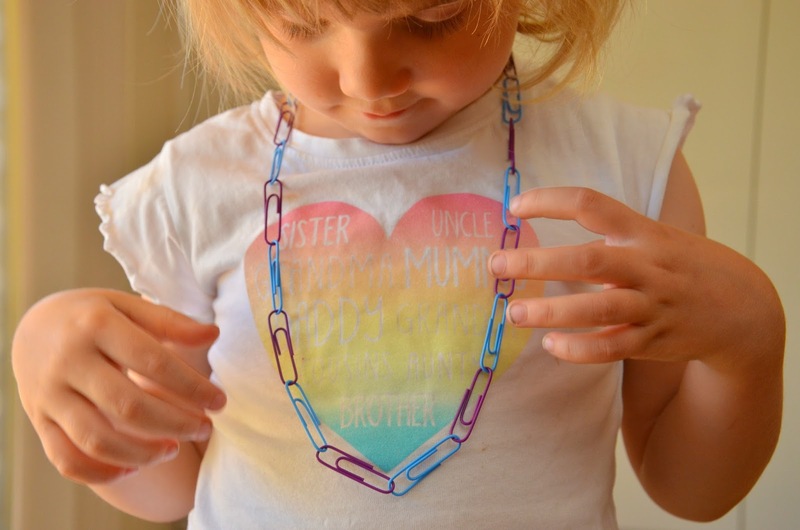 To make it harder - link the paperclips together in a pattern to make a chain. We had a lot of discussion about favourite colours and the objects of each colour prompted by the flashcards. 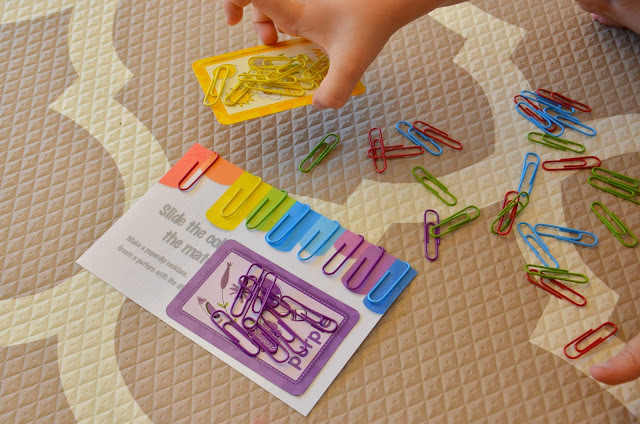 Sliding the paper clips onto the cards was still a bit tricky for Miss M so we'll keep practising that (as well as learning how to link them together). 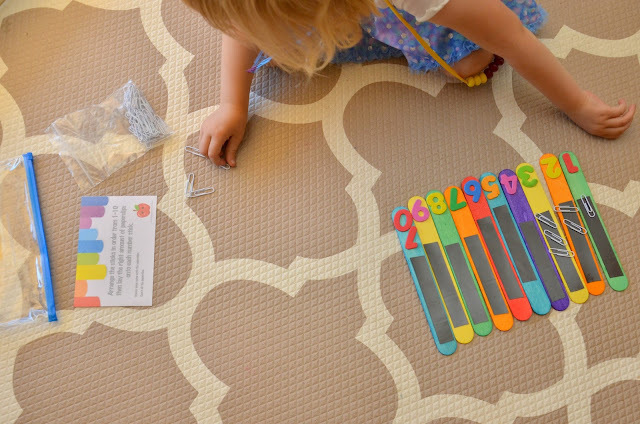 We even matched them up with the instruction card and then made a blue/purple pattern. Miss M watched carfeully as I linked them together to make a chain (I think this was her favourite part). Task - thread the beads onto the string. To make it easier - just focus one one colour or hold the bead for your child while they thread the string though. Miss M decided that she was going to make me necklace and that I wasn't allowed to watch (not ideal for blog photography but oh well)! She called me back when it was finished and I was then allowed to take my photo. Thoughtfully, she made it all green for me (my favourite colour) and then I made one for her. 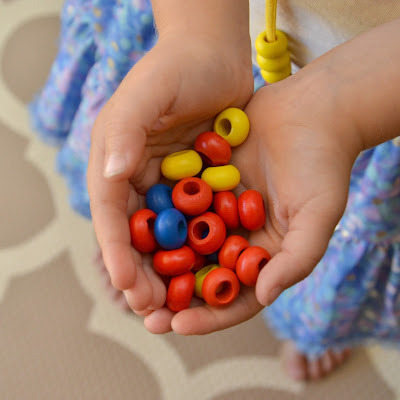 The beads are a great size for preschoolers and are easy to thread. 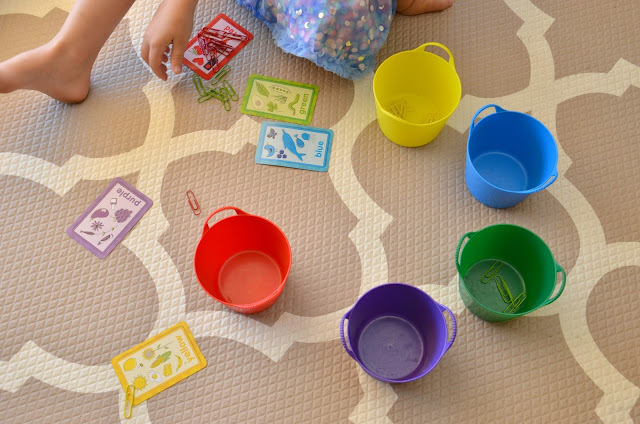 A great way to keep them busy, encourage concentration and fine motor skills. 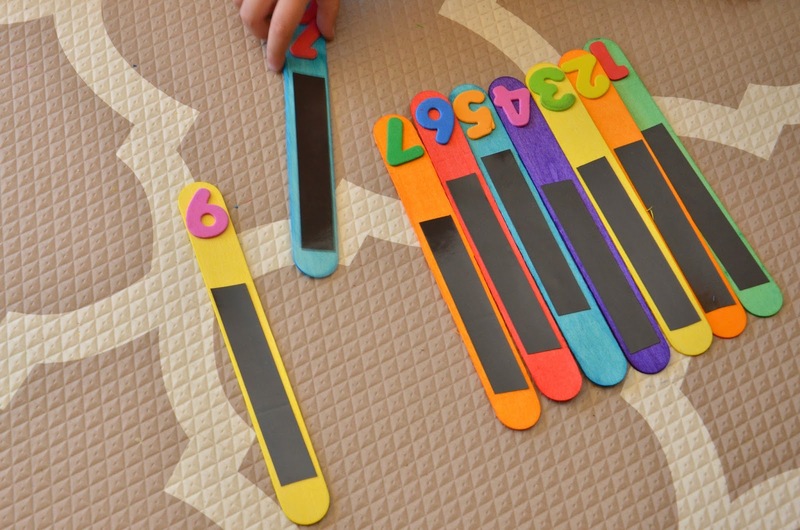 Skills - counting, numeral identification, 1:1 correspondence + explore objects that are magnetic! To make it harder - link all of the paper clips together and count the total. Come up with different ways to make 10 (eg 3 + 7, 4 + 6 etc...). I loved watching Miss M when she was playing with this busy bag. She would test out every number and say "does 6 go here? no... does 7 go here? no..." until she got to the right one. 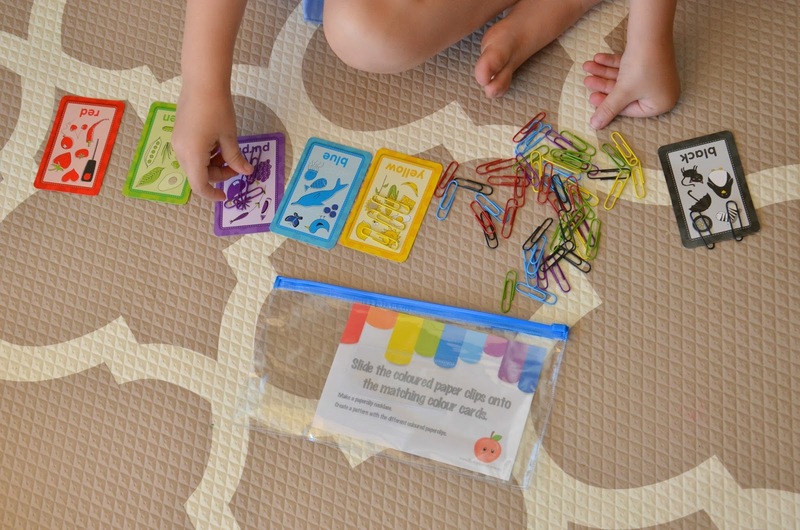 Do you have a go to busy bag or activity that you throw in your bag as you walk out the door with the kids? Nice post thank you for share this information.